In My Bookstore our favorite writers-from Elin Hilderbrand, to John Grisham, to Dave Eggers-express their adoration and admiration for their favorite bookstores and booksellers. 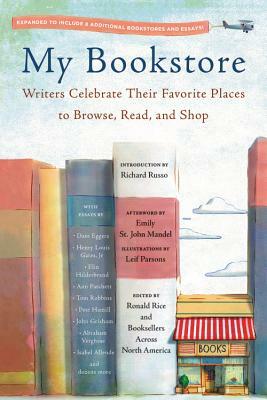 The relationship between a writer and her local bookstore can last for years or even decades. Often it is the author's local store that supported her during the early days of her career and that works tirelessly to introduce her work to new readers. But authors are also readers and customers, just like us. For them, as for most of us, bookstores serve as the anchor for our communities, the place that introduces us to new ideas (and new neighbors), and that sets our children on the path to becoming lifelong readers and lovers of books. Brimming with original, deeply moving, funny, and exceedingly well-crafted tributes to bookstores, from Longfellow Books in Portland, Maine (Ron Currie, Jr.) to Powells City of Books in Portland, Oregon (Chuck Palahniuk) and everywhere in between, My Bookstore is a joyful celebration of our bricks-and-mortar stores and a clarion call to readers everywhere at a time when the value and importance of these stores should be shouted from the rooftops. Ronald Rice has worked in book publishing as a sales and marketing professional for 25 years, working with and promoting bookstores. He was a four-time nominee for Publishers Weekly Sales Representative of the Year and has served multiyear terms on both the NEIBA and SEBA advisory councils. He lives in Philadelphia, PA.
Richard Russo is the author of 10 books. In 2002 he received the Pulitzer Prize for Empire Falls. He lives in Camden ME and Boston, MA. Emily St. John Mandel is the author of four books including, most recently, Station Eleven, which was a finalist for the National Book Award for fiction. She lives in Brooklyn, NY. Leif Parsons is an award-winning illustrator who's work has been published in The New York Times and Harper's. He lives in Brooklyn, NY.